Here’s an inside glimpse at what these initiatives entail and why this matters so much to our team. From Beyond’s beginnings, we recognized our people drove our success. So we created policies and initiatives that put people first and fostered a work environment people loved. We encourage constant feedback to optimize what we’re doing, and we encourage employees to spearhead new events, cultural experiences, and social initiatives that align with their passions and convictions. This has fostered unique cultures among each of our offices. We celebrate that autonomy and individuality, since no cultural space can be identical. At the same time we live by our shared core values of supporting, leading, inspiring, and learning from each other. Hearing insights like Talentwise’s report that 60% of employees in well-structured onboarding programs stick around for at least three years, we wanted to learn how this translated to our own culture. We conducted a series of surveys and interviews with current employees to hear the positive and negative experiences of integrating into Beyond’s culture, work, and growth. The results confirmed what we expected: An unstructured onboarding experience failed to build a strong foundation for employees, so most had to forge their own way forward. While this worked in the first scrappy, startup days of Beyond, as we matured we knew we needed to give new employees a true sense of purpose, making onboarding feel meaningful, celebratory, and focused on the new hire’s career. We decided to invest in taking more time at the beginning of each Beyonder’s journey to help them accelerate personal growth, support others, stay with Beyond longer, and learn to embody Beyond’s values. The process we created walks alongside each new hire, instilling knowledge, creating practice opportunities, and pacing activities so they become more manageable and less daunting. Built on the findings from our internal research, we created Flight Plan, an accelerated growth program for new hires, driven by Beyond’s core values. 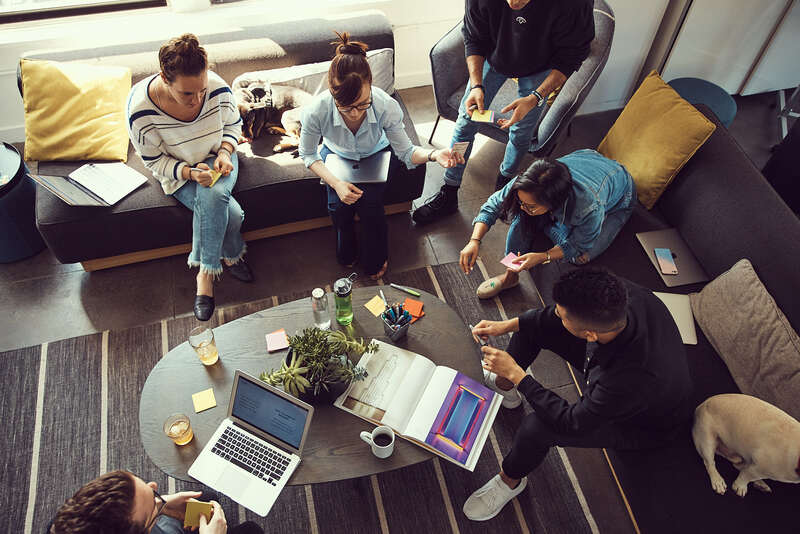 New employees receive an “itinerary” that outlines their first week of meetings, and pairs them with a “co-pilot,” a coworker outside of their team who takes them out to lunch and checks in regularly to answer candid questions about Beyond as an office and company. Throughout their first week they meet with department leads to understand Beyond services, systems, and history. By the second week they work with their managers to set 30, 60, and 90-day goals for their growth on teams and at Beyond. An HR product, Flight Plan brings together digital and real-world touchpoints to deliver a unique career experience. Managerial 1:1s and disciplinary and departmental meetings continue weekly or biweekly to ensure employees’ growth remains on track. For up to a year, the program is clearly outlined with what to expect along the way in terms of check-ins, goals, etc. Additionally, new employees are integrated into our Donut Buddy initiative, which pairs two employees at random every two weeks and encourages them to leave the office for a coffee, snack, donut, etc. — reimbursed by Beyond. This allows them to integrate into the wider culture and build relationships throughout the company. We talk about Flight Plan during the hiring process, letting prospective employees know that they can expect Beyond to invest in them and set them up for success. On every new employee’s start day, a company-wide email introduces them to global Beyond with a photo and responses they fill out with their hiring contract. On their first week, they’re introduced in office staff meetings and taken to a welcome lunch with team members and peers from other departments. Every Beyonder works hard and well, but often times some go above and beyond, leading a major initiative, securing client relationships, or improving the lives of their peers. We created “Above and Beyond” to give our employees an outlet to recognize peers that push us to be a better company. Nominations are continuously accepted and encouraged in each office for Beyonders who have exceeded expectations and deserve recognition. The winners are selected by the general manager of the respective office, who highlight their accomplishments during our bimonthly company-wide meeting. They receive a bonus and are entered into a drawing for a free trip to another office in one of our amazing cities. We take pride in all of our people and work hard to foster a supportive, appreciative environment. This is encouraged in many individual ways, but we realize some exceptional effort deserves more than a shout out in a weekly office meeting. By creating this excellence award, we have been able to highlight Beyonders who do such memorable, impactful work that it remains valuable to teams and the company months later. Additionally, the cross-office trip serve to better connect our global company, giving recipients and the offices they visit the chance to build a stronger professional community. Over the course of 3 years, we have recognized 120 employees globally. Employees are eager to celebrate each other every two months, and Above and Beyond is regularly highlighted as a key culture-building benefit in our quarterly employee satisfaction survey.